Taken a trip real soon so I wanted to look for something easier to be able to carry my drink with me and I came across Freehand Coffee Caddy. 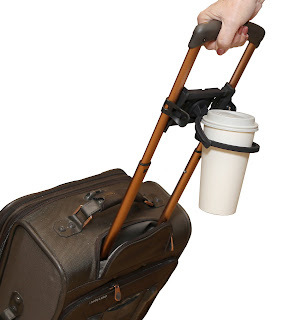 It comes in two colors pink and black it is a lightweight, self-level and travel cup holder that attaches to the handle of your carry-on bag. It holds bottles or cups up to 1 L, adjusts to fit any luggage handle 6 inches to 8 inches wide, made in the USA, weighs 5.5 ounces, quickly folds for easy storage, and veteran owned and operated. My Opinion: I found this very easy to put on my luggage and I like that instead of carrying it in my hand I just put my drink in this Caddy so I avoid getting cramps and weakness in my hand. This is going to be perfect for my trip in June to zip around the airport. Where to buy? You can find this at Brookstone, Sharper Image, Amazon Prime, and many more retailers.